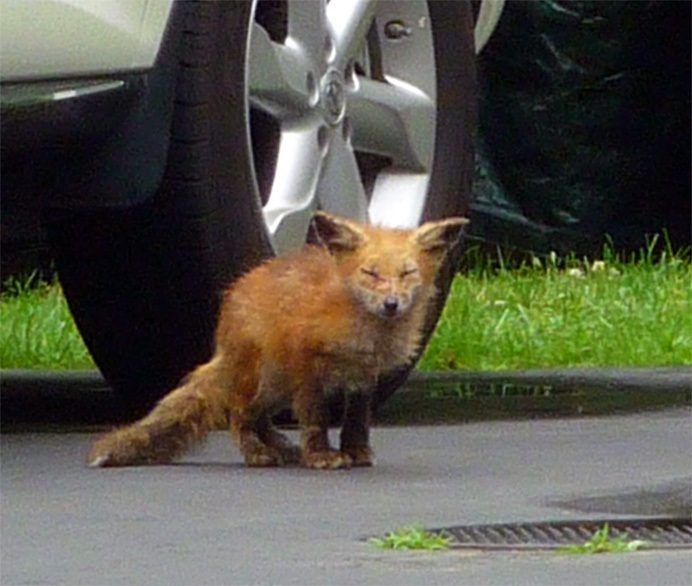 Last weekend, my wife, Mary, saw a red fox (Vulpes vulpes) as she was walking on Kilian Drive. Several neighbors have reported sightings, too. Sure enough, as I rounded the corner from Middle River Road onto Kilian today, I spied this kit standing in Fred and Lovie's driveway, watching me. You may think the animal's eyes are shut, but if you look closely, you'll see two tiny pupils staring out of the slits. This furtive gaze may help to explain the fox's fabled slyness. I cranked up my zoom lens and ambled closer, hoping to get a sharper picture. I expected the animal to bolt into the woods at any moment. Among hunters and trappers, foxes are renowed for their elusiveness. That's why an adult pelt typically wholesales at $75 or more. When I got within about 100 feet, however, the fox calmly walked to the door of a toolshed a few feet away and, once again, stood staring at me. Finally, as I drew closer, it glided off into the underbrush. At no time did it appear frightened. Something troubled me about this animal's behavior. Red foxes are mostly nocturnal. They sneak up on rabbits, mice, voles, and other small mammals, whom they can hear digging underground because of their unusual ability to detect low-frequency sounds. As in legend, foxes also capture and eat chickens and other birds. When game is scarce, red foxes eat berries and grasses or dig up food they have stored under piles of leaves. Unlike gray foxes, they don't sleep in dens. They simply curl up on the ground with their tail covering their nose. A couple of hours after I took this picture, my 17-year-old son Tom came home from school. I showed him the picture on my computer screen. "Yeah," he said, "I saw that when I got off the bus." "Yes. In the same driveway, only closer to the street." He said the animal had watched him for a moment before running away. In animals (as in humans), one sign of the inevitably fatal disease is unusual behavior. Googling the subject, I found this sentence in the Merck Veterinary Manual: "Commonly, rabid wild animals may lose their fear of humans, and species that are normally nocturnal may be seen wandering about during the daytime." I decided to phone Fred and Lovie. You can't be too careful. Because Fred was away on business, Lovie took the call. "I know," she told me. "I'm worried, too. We're trying to sell the house, you know, and I'm afraid the foxes will scare buyers away." The foxes, she said, had apparently denned under a toolshed beside her patio. "I'm going to call some experts about getting rid of them," she said. A couple of days later, I ran into Lovie during my walk. "So, what did you do about the foxes?" I asked. "I haven't seen them lately." Lovie grinned. "I called the state agricultural extension agent. He said to me, 'Do you have a husband?' I said, 'Yes; what's that got to do with it?' He said, 'Foxes hate the smell of human urine. Tell your husband to take a leak at the entrance to the den.'" "I'll be damned," I said. "My dad used to say the same thing. I forgot." Back in the 1950s, my father had been a fur-trapper. "Foxes are the hardest critters to outfox," he used to say. Because they feared anything a human had touched, he always wore new gloves when setting traps for them. The extension agent's prescription made perfect sense. "Wait a second, though," I added. "Isn't Fred away on business?" "Yes; he's coming back Tuesday." "Oh," she said, grinning again, "I found a way." Note added March 17, 2011: Fred and Lovie sold their house soon after this incident. As far as I know, no foxes have been sighted on the property since.